I will eat anything vanilla flavored. 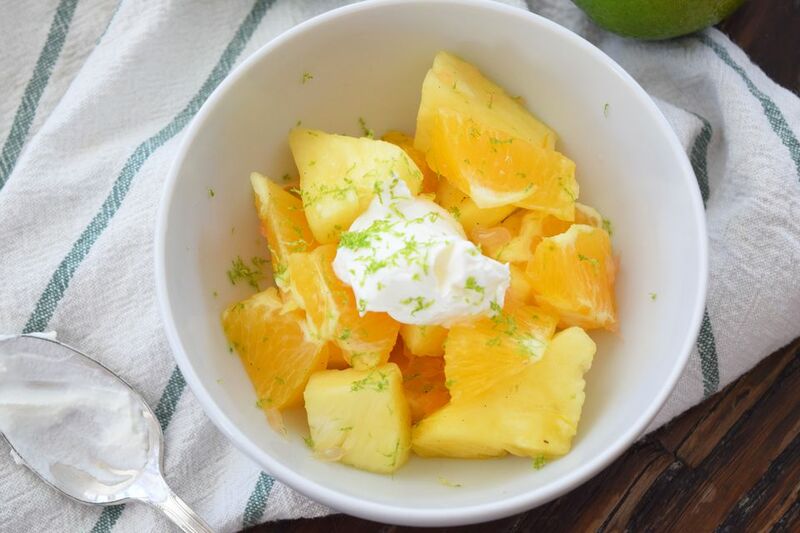 The sweet and florally flavor goes surprisingly well with citrus and pineapple! It gives an extra little pop of flavor to an otherwise boring fruit salad. Berries and other fruits can easily be substituted for the citrus fruits. Just don't be a square and make your fruit salad totally out of cantaloupe. Does any one even really like cantaloupe? Why are restaurant fruit salads always made completely out of cantaloupe, and even worse honey dew melon? Must be because it's cheap. But you are at home and can make it however you want and with whatever is in season! Summertime=berries and peaches, while the winter is a great time for citrus fruits! Fruit salad is super easy to whip together for house guests or brunch goers. It's refreshing, goes with any kind of breakfast foods (especially bacon, eggs, and pancakes). I like to serve the fruit salad with a little vanilla yogurt. You can use greek or regular yogurt. A little lime zest is also a delicious zingy addition to the top of each fruit bowl. If you have vanilla sugar you can use it as a substitute for the vanilla extract and powdered sugar. Vanilla sugar is just made from whole vanilla beans, scraped and mixed with regular white sugar. The empty vanilla bean is also buried in with the sugar. It can be kept in an airtight jar for quite a long while and is a great substitute for regular sugar in many of your baking recipes! The fruit salad can be kept in the refrigerator for about three days. It's best to let the fruit salad sit for about 20 minutes before serving, so the vanilla flavor can penetrate the fruit! Cut the oranges and grapefruit into small pieces. Make sure to remove as much of the pith and outer membranes. It will look prettier and taste better this way. Whisk together the freshly squeezed lime juice, vanilla extract, and powdered sugar. If you have vanilla sugar that can be substituted for the powdered sugar and vanilla extract. Just use 1/4 cup of vanilla sugar. Drizzle the sugar mixture over the fruit salad in a large bowl. Toss the fruit to combine with the sugar mixture. Allow the fruit to sit in the refrigerator, covered for about twenty minutes before serving. Serve the fruit salad with vanilla yogurt. You can use greek or regular. Zest a lime and garnish individual bowls with the lime zest. How Do You Make a Creamy Filipino-Style Fruit Salad?